Cut out a 12×24 cm rectangle from red fleece. 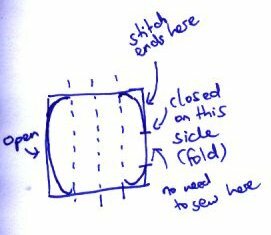 Fold it once so the wrong side you’ll be sewing on is outside. 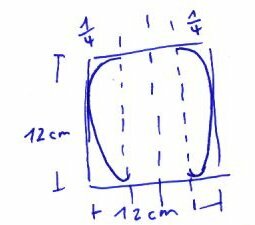 You’ll get a square on which you need to draw the shape on. Make sure you sew all along the edge on the open side. For the remaining ones, follow the sketches. You should close the bottom as you can still stuff your apple from the top hole. Leaf (optional): Isn’t included in the original Apple of Archer but makes the apple look more like an apple. Cut out two leaf-shaped pieces, sew along the edge, turn inside out. Use darker thread to sew on the leaf structure if you like. Arrow: White in the original picture, I used black fabric here. Might try it with white or gray fabric if I redo it. (What I haven’t tried is making the arrow out of two pieces since you won’t see the middle part anyway.) Cut out a 25×2 cm piece, fold once lengthwise, sew along the dotted path below. Please note that both sides are open. Try to turn it inside out, I wish you the best of luck. (Before you give up and throw it away, cut off two pieces that you want to use for the back and front parts. How long you make them is up to you. Try turning them around again.) Make the arrow head and the feather tail like the leaf. Don’t assemble the parts yet. Stuff everything. If you can manage, the arrow will be robust enough, but you can still put some wire in. Cut two little holes in your apple to put the arrow through. You may have to re-stuff the apple again. Sew the arrow to the apple. Now sew the remaining parts onto the arrow. If you made a leaf, sew that onto the stem before sewing it on your apple (while closing the apple). You’re done! For making it a real headgear, sew on a hair clip or attach your plush apple to a hairband.